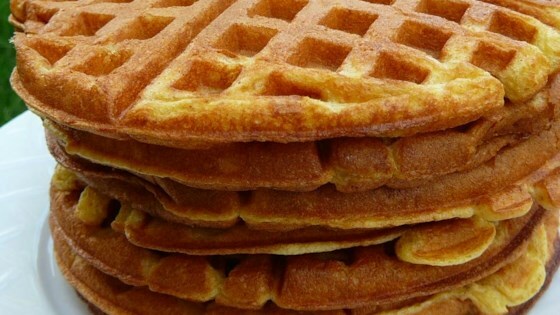 "This is a rich, soft waffle with lots of taste. The batter is thick, will spread some on its own." Preheat a waffle iron according to manufacturer's instructions. Beat eggs in a large mixing bowl, then add yogurt, flour, baking powder, baking soda, kosher salt, and shortening, mixing until smooth. Pour batter onto hot waffle iron. Cook until no longer steaming, about 5 minutes. As written this recipe is too greasy, I got a much nicer result when I subbed a little less than 1/4 cup of canola oil for the shortening. The waffles turned out very soft and fluffy. I thought the flavor was fine, but I don't think all the fat is necessary. I prefer waffles that are light and moist on the inside and lightly crispy on the outside. This is a very good recipe. It is thick,but it spreads well.It was a very soft waffle. I only used 6Tbsp of melted shorting. They were not greasy at all. I will be making these again.